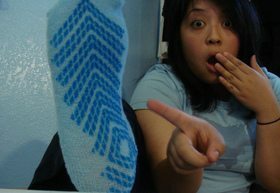 When I was in the hospital, one of my favorite "gifts" was a pair of non-skid slipper socks. (I love hospital swag!) They were very similar to these non slip socks. I even talked at great length about how much I like those socks. The truth is I’ve had my eye on a few pairs of non-skid socks for awhile now. Good news: Now you can make your own non-skid socks. All you need is fabric paint! This video shows exactly how to do it, step-by-step. It’s really easy!